Mrs. Yvonne Owens Thomas, age 91, of Stendal, Indiana, passed away Friday evening, January 18, 2019, at Memorial Hospital in Jasper, Indiana. She was born August 21, 1927, in Braholm, West Virginia, a daughter of the late Vess and Stella Myrtle Riley Owens. Yvonne was of the Christian faith and she enjoyed reading her bible, doing puzzles, sewing and spending time with her family. 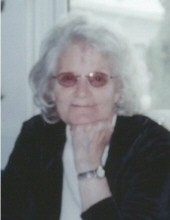 In addition to her parents, she was preceded in death by her husband of 54 years, Dempsey Thomas; two sons, Mark Houston Thomas and an infant son; two daughters, Sandra Thomas Dyer and Sophia Ann Thomas; one grandson, Buford “B.B.” Thomas Jr.; and two brothers, Charles Owens and Danny Owens. Yvonne is survived by six sons, Buford Thomas (Betty) and Tony Thomas (Charlene), all of Winslow, Indiana, Ruford Thomas (Debbie), Farron Thomas (Toni Jo), and Jeff Thomas (Karen), all of Vanceburg, Kentucky, and Sonny Thomas (Serena) of Morehead, Kentucky; one daughter, Starlin Blount (Don) of Stendal, Indiana; 21 grandchildren; 36 great grandchildren; nine great-great grandchildren; four brothers, Forrest Owens of Grayson, Kentucky, Jewett Owens and Jimmy Owens, both of Emerson, Kentucky, and Robert Owens of Vanceburg, Kentucky; and two sisters, Jean Back of Globe, Kentucky, and Joyce Branham of Hayden, Alabama. She also leaves many other family members and friends who will sadly miss her. Funeral services will be held at 11 a.m. Saturday, January 26, 2019, at Globe Funeral Chapel in Olive Hill, Kentucky, with Brother Travis Cooper, Sister Jenny-Lynn Copley, and Brother Tylier McAdams officiating. Burial will follow in the Owens Cemetery in Emerson, Kentucky. Friends may visit from 6 p.m. to 8 p.m. Friday, January 25, 2019, and after 9 a.m. on Saturday at Globe Funeral Chapel, 17277 West Highway US 60, Olive Hill, Kentucky 41164. Yvonne’s grandsons and great grandsons will serve as pallbearers. "Email Address" would like to share the life celebration of Yvonne Owens Thomas. Click on the "link" to go to share a favorite memory or leave a condolence message for the family.